There are many cost-effective opportunities available with a Chamber membership. All Chamber members can benefit from banding together and leveraging our economies of scale as a whole as it pertains to retirement plans. Click HERE to find out more about the Multiple Employer Plan (MEP) that is sponsored by the Cayuga County Chamber of Commerce. Do you need a conference room or meeting space to accommodate your business or organizational needs? Perhaps you need a classroom setting with technology to support your presentations. 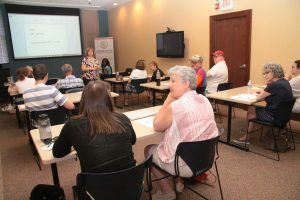 Chamber members have access to our two meeting spaces within our 2 State Street location during regular business hours. Click HERE to download information about our conference rooms. The Chamber also offers support to member businesses of all sizes through educational seminars and programs. Click HERE to learn more about the Professional Development and Educational resources available to Chamber Members. A low-cost advertising opportunity is available to all Members via The Chamber’s email marketing efforts. The Chamber sends a weekly email and quarterly newsletter to over 1,000 subscribers (Chamber Members and others involved or interested in our business community). Members can market their product, brand, service, or event via vertical banner ads in these emails and can also submit announcements to be included in “Member News,” a free advertising opportunity in our quarterly newsletter. Click HERE to get more information about Marketing & Sponsorship opportunities.